Melissa Koenig, Principal of Alamo Elementary and Director of Elementary Instruction at Otsego Public Schools, agrees with her teachers that writing is one of the toughest subjects to teach. Fifth grade teacher, Sara Jewett, recognized a trend among her students. She said they showed a lack of enthusiasm for writing which translated into mediocre writing. Melissa Koenig realized that this wasn’t an isolated case, but rather a district-wide issue. Something needed to be done. Otsego Public Schools is a school district located 15 miles north of Kalamazoo, Michigan. The district consists of 2,300 students and encompasses one high school, one middle school and three elementary buildings. The district’s free and reduced percentage is 44%. Two of the three elementary buildings qualify and receive Title I funding, with each building having just slightly over 50% free and reduced. Prior to adopting WriteSteps, the writing program Otsego had was not being used with fidelity. There were inconsistencies within the district on how much time was spent teaching writing and how frequently writing instruction was occurring at each grade level. It seemed to be the first thing to go when teachers were running short on time. The schools did not have common prompts or assessments to compare data; conversations about writing were few and far between; and teachers were not comfortable teaching writing. The task seemed overwhelming. In 2012, after receiving another dismal report from the state writing assessment, the Superintendent asked the directors of instruction to focus their work on developing a plan of improvement for their declining writing scores. The district decided to make a district-wide purchase of WriteSteps in the winter of 2012, to improve their writing and grammar skills among kindergarten through fifth grade students. It was at this time that Otsego began a voluntary third grade professional learning community (PLC) district-wide. Two of the three elementary buildings chose to participate in the PLC. When the meetings began, they delved into the data and sought out to see what the data revealed. In the buildings that participated in the PLC, test scores improved by 37%; while in the building that didn’t participate, the scores continued to decline. After results showed drastic improvement, all three buildings implemented the PLC process and all three showed growth. Sara pictured working in a PLC with her co-worker, Brian. One of the things Sara appreciates about WriteSteps is the ease of use of the online subscription. She clicks the day she is on and gets her detailed daily lesson plans and supporting materials. Sara has a clear scope and sequence of each unit. 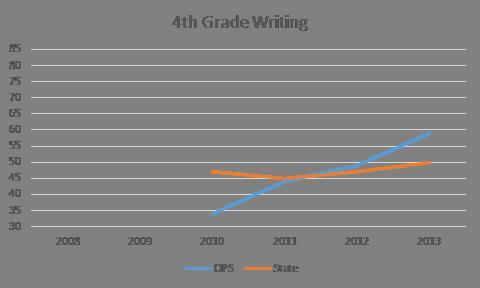 As a district, they saw marked improvement in their fourth grade writing scores from 34% in 2010 to 59% in 2013. How will we know when they are learning? 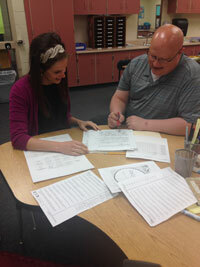 Teachers met monthly to review student progress, compare data and develop a plan for improvement for the next month. Melissa is an avid supporter of PLCs and has found that they strengthen teaching skills and ensure that students aren’t just being taught, but that they are learning. The PLC format allows teachers to utilize data to inform their instruction. 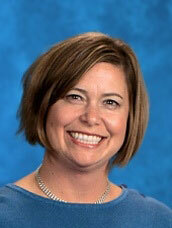 Melissa believes WriteSteps gave her teachers the confidence they needed to turn writing around at Alamo Elementary. WriteSteps provided a framework that worked well with all of her teachers, ranging from recent graduates to veteran teachers with 20+ years of experience. The increased scores caught the attention of the media and made the front page of the Kalamazoo Gazette and Mlive, an online Michigan news source. Otsego made “unprecedented growth” in all areas, and in all buildings, in the fall of 2013. With this improvement, the district received the Districts of Distinction award by District Administration magazine in November 2014. This national recognition program honors school districts leading the way in establishing initiatives that yield quantifiable benefits that other districts could replicate. It’s been an incredible journey for Otsego schools. Writing instruction, which was once an overwhelming task, is now the catalyst for improved test scores. Creating district-wide consistency in writing instruction through WriteSteps and participating in PLCs has lead Otsego to receive a national award while creating more confident and successful writers. “In my 20 years in education, I would rate WriteSteps as the best writing program.” said Melissa Koenig. Terri Caldwell-Ayre, a teacher at Sutton Elementary, shares a tip for making the editing process more exciting and engaging for her students. Stop by the WriteSteps booth at the National Charter School Conference and say hello to Herman Humes. He will be happy to answer any questions you have about WriteSteps! Are you going to be at the National Association of Elementary School Principals Conference in Long Beach, CA? If so, say hello to Awareness Ambassador Herman Humes and learn more about our K-5 writing and grammar program.